The new training programme for staff and research students is available here to view and book onto. This year we are running sessions on open access, critical appraisal, systematic reviews, Endnote, Endnote web, mobile apps, keeping your research up-to-date, using prezi and searching for the evidence. We are also running weekly sessions for students providing help and support for searching for information and these can be booked on to here. This entry was posted in training on September 12, 2014 by Lindsay Roberts. This entry was posted in Electronic Resources, training on January 13, 2014 by Lindsay Roberts. Want to learn more about EndNote Web, Open Access Publishing or Using Apps on your Christmas gift tablet ? Those are the sessions we are running this month for Academic Staff and Research Postgrad students. This entry was posted in training and tagged endnote on December 23, 2013 by Mariann Hilliar. Want to learn more about Zotero, apps or preparing to publish? Those are the sessions we are running this month for Academic Staff and Research Postgrad students. Email healthlibrary@cf.ac.uk to book your place. This entry was posted in training and tagged training on November 8, 2013 by Lindsay Roberts. 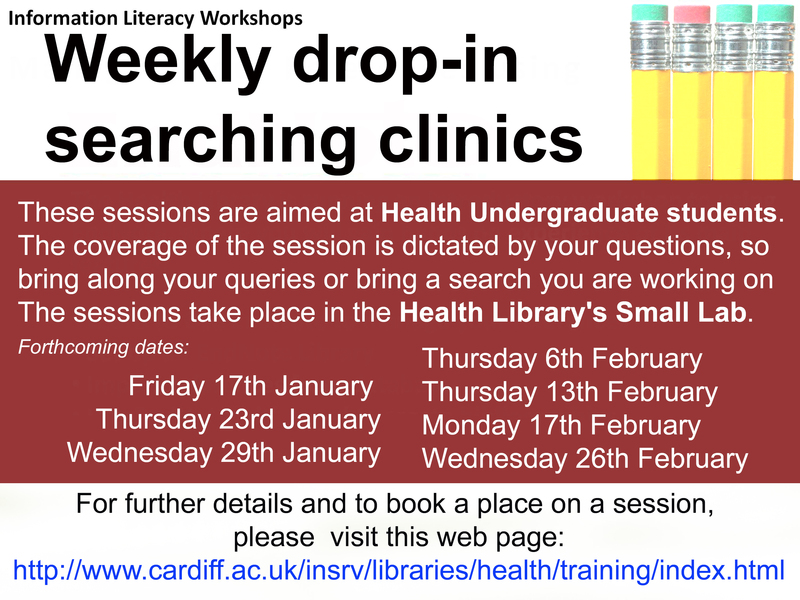 Those of you in the throes of your dissertation, if you need some help tweaking references and general library advice we have the following sessions where you can just drop in for help. All sessions are in the small IT lab in the Health Library, Cochrane Building. This entry was posted in training on May 13, 2013 by Lindsay Roberts. We’ve got some new training sessions offered – look at the page above ‘Teaching Programme’ to find details of dates and times. Let us know if you would like to see anything specific covered. This entry was posted in training on May 10, 2013 by Lindsay Roberts. The workshop is open to all authors, researchers, and research students who would like to know what they can expect from publishers with regards to Open Access, and what they can ask for. Wilma Mossinck is a specialist in negotiating publishing contracts, and the workshop will cover the differences between transferring copyright and licensing, and what the new Creative Commons licenses mean in Open Access publishing. All kinds of publication can be covered, including monographs, theses and articles. There is no need to book to attend this event, please just come along on the day. However, please note that the capacity of the room is limited so seating will be available on a ‘first come, first served’ basis. This entry was posted in training and tagged open access on May 9, 2013 by Lindsay Roberts.